The first and most critical step in beating any addiction problem is to recognise that you have one. For many addicts and alcoholics, they go through a process of years of denial before finally admitting defeat and accepting help. For many years addicts and alcoholics live in a world where they would love to be free from their addiction, but cannot see the light at the end of the tunnel. So, they accept defeat, that their problems are too difficult to overcome or they are simply too scared to go through the emotional and physical pain of confronting the addiction. Some alcoholics and addicts, despite the negative consequences of their behaviour becoming more costly and more frequent, enjoy drinking and/or using drugs so much that they just don’t want to stop. The concept of ‘Acceptance’ is key in addiction recovery. Once a person accepts that they have a problem they open themselves up to others for help. Acceptance is not about knowing the answers and knowing what to do, it’s simply saying ‘I have a problem’ or ‘My alcohol use is causing me problems that are having a detrimental impact on my life which I don’t want to happen anymore, but I can’t stop myself’. This is when Rehab Healthcare can step in and start to facilitate the process of change. Pre-contemplation, (What problem? Go away!) At this stage people don’t want to admit that they have a problem and avoid talking about it. Some people stay in this stage of change for a long time and often experience growing problems. This difficult stage is often called “denial”. Contemplation, (I want to change… but then, I don’t) You may well have mixed emotions about quitting. On good days, you don’t think you have a problem. After a serious ‘hangover’ or on a ‘comedown’ you state to ‘never do it again’. Here you at least become aware of your problems, struggle to understand them and even may think seriously about solving them. Preparation, (I know I have to change, but how?) Here is where you start to make decisions. While some people become chronic contemplators and analyse as oppose to taking action, someone serious about change will make decisions and prepare for them. At this stage, you may start to open up to people about your problems and look at the different treatment options available to you. Action, (Actively engaging in treatment services!) This is the point when you take all the action required to try and make the change. You go into rehab, you end relationships with old associates and you follow your recovery plan. You get support from whatever source you can and you ask for help when you need it. Lapse and Relapse Inevitably, addicts and alcoholics do lapse and go back to having a drink or taking a drug. They will then have to go through the cycle of change again. The question is, how quickly? If the person acknowledges the error, identifies what was behind the lapse, they can go straight back into Action and Maintenance – getting back to meetings, re-engaging in Aftercare services. Others spiral back right to the start – often to even deeper depths of depravity as the guilt and shame associated with ‘failing’ make the situation even worse. 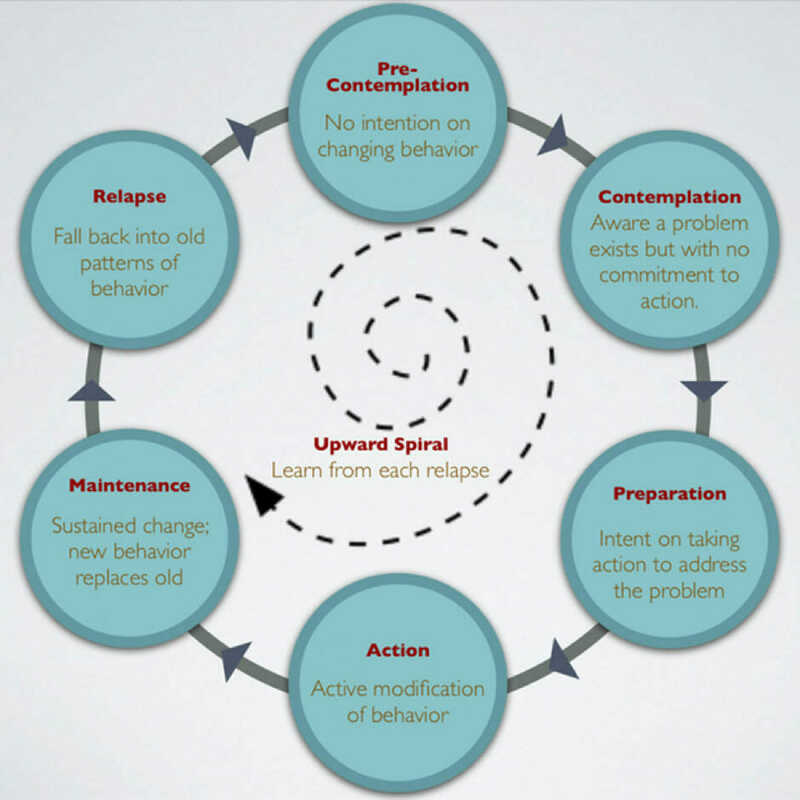 Unfortunately, many addicts go through this cycle numerous times before finally getting it right. If this rings true for you or a loved one, do not give up on hope. Everyone has a journey which involves ups and downs, but as people lapse and relapse, they learn from their mistakes which better prepares them for their next battle. Rehab Healthcare have worked with clients who have attended rehab and have inevitably relapsed, but they always know where they went wrong. They stopped taking action, they stopped following their recovery plan. But they know how to stay clean and they will learn from this next time, they will not allow complacency to set in. Whatever stage of the cycle you or your loved one is in, there is always a reason to call Rehab HC. Our staff have been through this cycle, many, many times! We are all now in Maintenance. We are actively working a recovery programme and we can help you to do the same. If your loved one is in Denial or Pre-contemplation, it may be that we can help you as a loved one to take the right steps to push your loved one into Contemplation, thinking about change. It may be that you need support yourself and want to seek some guidance from our Team. 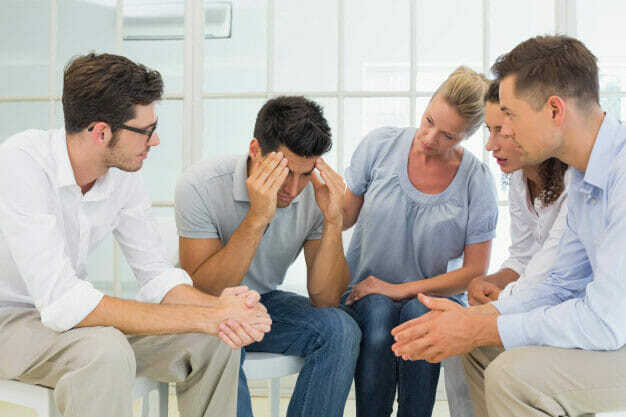 And finally, if you have made your decision, or your loved one has told you that they have a problem and need to do something about it, call Rehab Healthcare and we can spring you into Action!.